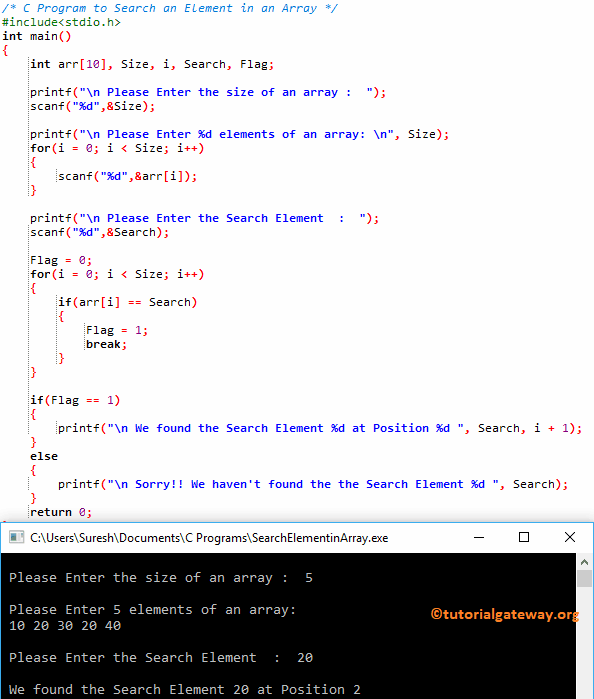 In this article, we will show you, How to write a C Program to Search an Element in an Array with example. Before going into this article, Please refer Array in C article to understand the concept of Array size, index position etc. This program ask the user to enter the Array size, Array elements and the Search item value. Next, it will check whether the user entered search item is present in the array or not using For Loop. The value of i will be 1 and the condition (i < 5) is True. Next, we used If else Statement to check whether Flag value is equal to 1 or not. If true then Search item is present else not present.